“All political careers end in failure,” said Enoch Powell; Gore has not won an election on his own since his 1990 re-election to the Senate from Tennessee. His 1988 presidential bid ended well short of the nomination. Many observers felt Gore was headed for defeat in a third Senate campaign as the south continued to swing Republican; Clinton’s offer of the vice presidential slot in 1992 gave Gore the opportunity to reach a national audience as his home state cooled. On his own again in 2000, gifted by the departing Clinton with the most bubbliciously expanding economy in American history and a comfortable budget surplus, and insulated from the innuendo and scandal of the Clinton White House by his still-vibrant marriage, he found the elusive road to defeat against a flawed and inexperienced challenger. Tennessee voted for Bush; Florida or no Florida Gore would have gone to the White House if those who knew him longest and best had rallied to his support. 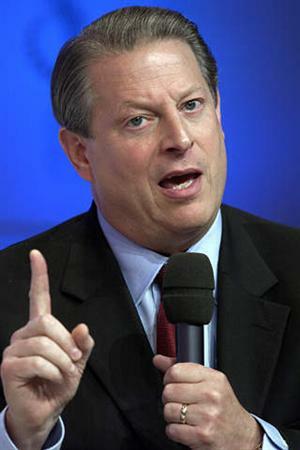 Algore to Receive Award for WHAT? First he received a PEACE prize for committing fraud with his Gorebull Worming. It had nothing to do with peace at all. Now he is set to receive the FREEDOM award from the National Civil Rights Museum for his scam, which has nothing to do with freedom or civil rights. I almost forgot the Oscar his Hollywood friends gave him for Inconvenient Truth. It was wrong on two counts. The vote was rigged for political reasons, and it was a work of fiction, not a documentary. The man has no shame. MEMPHIS (AP) — Former Vice President Al Gore will accept the National Civil Rights Museum’s annual Freedom Award in Memphis. Gore and civil rights activist Diane Nash were named as recipients of the awards in August. They’re scheduled to receive the awards at a banquet Tuesday. The museum has said Gore is being honored for helping raise the world’s awareness of the dangers of man-made climate change. Nash will be recognized for her pioneering civil rights work in the 1960s. 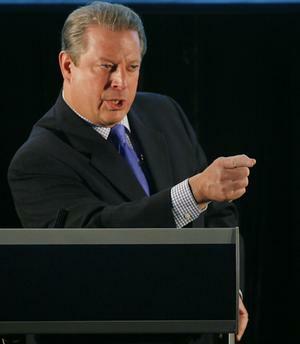 Since losing the presidential election to George W. Bush in 2000, Gore has made combatting global warming his primary public focus. He was awarded a Nobel Prize for that work, and his documentary, “An Inconvenient Truth,” won an Academy Award. So they are having another Gorebull Worming debate this week in London. What do you think happened? Yep, right on cue, Record snow and cold. The curse of Algore is alive and well. You’d think these people would get the hint. 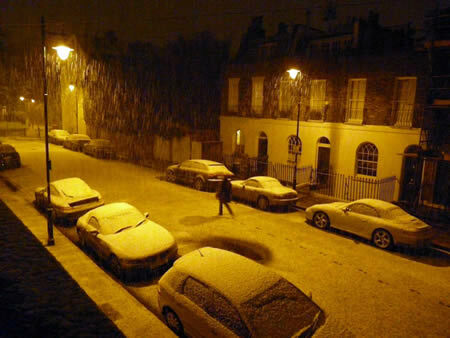 Snow fell in London for the first time in October since 1934, while thermometers fell below zero across the country. Hertfordshire saw up to two inches of snow. With road gritters out in some areas, night-time temperatures dropped to a bitter 24F (-4C) in eastern England last night with similar lows forecast for tonight. In northern Scotland, gale force winds left temperatures feeling much lower. ST. PETERSBURG, Fla. — Temperatures across the Southeast including northern Florida hit record-breaking lows early Thursday and a hard freeze extended as far south as Ocala, in the heart of Florida’s citrus country, according to the National Weather Service. I was surfing Anthony Watts’ site just a bit ago. According to NOAA, The US has broken or tied 115 cold records, and set 63 new snow records. Go check out the details at Watts Up With That? Beware!The Ice Age Cometh. More evidence that the new ice age is coming. 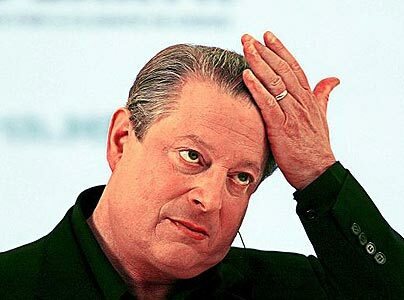 For all the hot air that Algore blows about global warming, the evidence is against him. Take a look at this from Science@NASA. Sept. 30, 2008: Astronomers who count sunspots have announced that 2008 is now the “blankest year” of the Space Age. The image, taken by the Solar and Heliospheric Observatory (SOHO) on Sept. 27, 2008, shows a solar disk completely unmarked by sunspots. For comparison, a SOHO image taken seven years earlier on Sept. 27, 2001, is peppered with colossal sunspots, all crackling with solar flares: image. The difference is the phase of the 11-year solar cycle. 2001 was a year of solar maximum, with lots of sunspots, solar flares and geomagnetic storms. 2008 is at the cycle’s opposite extreme, solar minimum, a quiet time on the sun. Still think the Goreacle knows what he is talking about? I can only hope people will wake up to the fraud of Global Warming. The sunspots, and NASA (which are very reliable) refute what Algore is saying. Which would you believe. SnakeOil Salesman, or hard science? Algore is seeing the writing on the wall. The next ice age is just around the corner, and people are wising up to his gorebull warming scheme. Now he says it’s O.K. to break the law if it benefits him. Nice way for a former VP to act. But then again, he’s a democrat, and we all know there’s a different set of rules for them. “If you’re a young person looking at the future of this planet and looking at what is being done right now, and not done, I believe we have reached the stage where it is time for civil disobedience to prevent the construction of new coal plants that do not have carbon capture and sequestration,” Gore said, according to Reuters. It wasn’t clear what specific action he intended by “civil disobedience,” which calls for the intentional violation of laws deemed to be unjust.